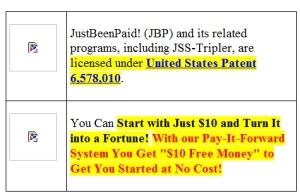 Certain images will not load today on the website of JustBeenPaid, a "program" tied to JSS Tripler. EDITOR’S NOTE: HYIP critics long have pointed out that many Internet-based schemes have members in common and that the interconnectivity of certain schemes creates a condition in which fraud proceeds circulate from scheme to scheme to scheme. Such fraud schemes can mushroom to involve tens of thousands — or even hundreds of thousands — of participants. The logistical challenges of reverse-engineering such schemes are enormous — and it’s often the case the combined international hauls of the schemes also are enormous. A man referenced in a JSS Tripler-related action by CONSOB, the Italian securities regulator, appears to have lost access to his U.S.-based website — and appears also to have been a pitchman for Text Cash Network, a U.S.-based “opportunity” linked to serial hucksters Joe Reid and Phil Piccolo. TextCashNetwork purports to be an international text-advertising business involving cell phones. The “opportunity,” though, is decidedly murky. Affiliates have described Text Cash Network vaguely as “a new division of a five year old communications company owned 100% by The Johnson Group.” Other promoters have claimed it was owned by the “Johnson & Johnson Group,” a possible bid to leech off the brand of the famous pharmaceutical and consumer-products company. On Jan. 23, CONSOB announced the JSS Tripler-related action. Included in CONSOB’s statement were references to an individual named Mauro Messina and a website styled gruppounitoworld.com. That website, which appears to have been hosted in the United States, now beams this message: “I’m sorry, but this account has been suspended.” No reason for the suspension was provided. The message appears even though the domain registration is good through June 30, 2012, according to registration data. Driven by a relentless hypefest, Text Cash Network or TCN launched late last year — with Reid leading the cheerleading as he had done previously for Data Network Affiliates (DNA), a Piccolo-associated entity that mixed and matched itself with One World One Website (OWOW), another Piccolo-associated entity. Both DNA and OWOW appear to be defunct corporations, but appear also to maintain a web presence that in part has been used to drive traffic to TCN. Strangely, the DNA website now is publishing a “STOP SOPA” graphic, referring to antipiracy legislation in the United States that became part of well-publicized opposition campaigns by Google and Wikipedia (among others). Like DNA, TCN purports that it has or will engage in philanthropic pursuits. And like TCN, DNA also purported to do business from Boca Raton, Fla. — and to operate a “processing center” there while providing “tax” benefits. CONSOB’s Jan. 23 announcement also referenced an entity known as “Ricochet Riches” and a dotcom by the same name. On the MoneyMakerGroup Ponzi forum yesterday, a cheerleader for JSS Tripler 2 or T2 — an enterprise that appears to have appropriated the name of JSS Tripler — published an “I got paid” post for T2. Below the post was a link to Ricochet Riches. Incongruities that challenge description and involve both JSS Tripler and JSS Tripler 2 are occurring all over the Ponzi boards. Both JSS Tripler and JSS Tripler 2 have promoters in common. Regardless, Ponzi-board posters are pooh-poohing the CONSOB action or ignoring it — even as they champion other opportunities referenced in the CONSOB action, including Ricochet Riches. CONSOB last year took action against promoters of Club Asteria, another Ponzi-forum darling. “Andrea Viz,” another JSS Tripler promoter referenced in the CONSOB action, also has been linked to Club Asteria. The Club Asteria promo appears on a domain styled vizconsigli.com, which is referenced in the CONSOB announcement about JSS Tripler. That domain, too, appears to be based in the United States. Hank Neeedham, one of Club Asteria’s purported principals, formerly was a pitchman for AdSurfDaily, which the U.S. Secret Service described as an online Ponzi scheme involving at least $110 million. Frederick Mann, the purported operator of JSS Tripler, also was an ASD pitchman, according to a 2008 promo that appeared online during the same period in which Needham — who simultaneously was promoting cash-gifting schemes — also was promoting ASD. Over the weekend, JustBeenPaid, the entity that purportedly operates JSS Tripler through Mann, appears to have encountered website problems that are affecting its ability to publish certain graphics. “. . . sites all messed up chat room no mods no admins little odd,” a MoneyMakerGroup poster claimed. The JustBeenPaid site includes information attributed to Mann on AdVentures4You (ADV4U), a “program” that collapsed in 2009 amid reports its operator had been threatened. In the remarks, Mann asserted that he made a pile of money through ADV4U prior to its collapse. “The biggest difference between JSS-Tripler and AV4U is that JSS-Tripler is indefinitely sustainable, while AV4U had a design flaw that ensured its eventual failure,” according to the remarks attributed to Mann. Wow, I was unaware that the US issued patents of scams or should I say “opportunities”. If only these people could tell truth from fiction. This would be the same Mauro Messina that these were? Quite prone to promoting illegal activities worldwide, I see.